The Early Learning Coalition matches whatever funds are received through our local partners such as Kiwanis for book distributions. Books are distributed at least three times a year. The sites serving a high percent of children from families living below the Federal Poverty level are prioritized. During the book distribution week, preschool sites are provided with a book box that includes an age appropriate book for each child in the program, lesson plans that provide additional extension activities based on the chosen book, a home activity to extend the learning and literacy experience into the home, as well as a parent educational flyer focusing on the importance of reading to children. Teachers read the chosen book to the children each day during the book distribution week. They also follow the provided age specific lesson plans that provide enrichment activities for children. All lesson plans are aligned with the state educational standards. 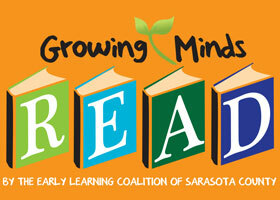 The Early Learning Coalition of Sarasota County has also established a Pinterest page where teachers can access additional online activities, pictures, and songs. All activities keep with the theme of the chosen book. On the last day of the book distribution week, the children take home a copy of the same book they have interacted with in their classroom all week. Children and parents are also asked to read the book and complete a simple activity together, most often the children and parents create a picture together or use the learned concepts during everyday routines around the home. The following week, children share the home activity with their classmates. The home activity strengthens the home and school connection and reinforces the importance of literacy at home. Over 4,000 books are distributed each year.